For any e-commerce site today, one of the most important requirements is to make the checkout process fast, easy and secure without cutting any corners. After all, this is the part of the visit for your customer which fulfills the bottom line of running your business, to make sales and earn profits. While many websites are very well designed, the checkout process is either so slow, glitchy or confusing. Often this prevents customers from finishing completing their purchase. To have a well-functioning e-commerce site in its complete and true sense, you must strategically optimize the checkout process. You might have heard, that allowing guest checkouts is a useful feature for new customers. Considering how ‘lazy’ internet surfers have become, rest assured, a lot of them probably may not want to register on your website. It’s not that people are lazy, they are often simply too busy and will buy your product if they don’t have to create an account. Makes sense right? But it might not be so obvious that a guest checkout is even more useful for returning customers. Why? They often forget their password because the last time they shopped with you was a year back. What can they do in this scenario? If you don’t have a guest checkout, the only option they have is to use the password recovery – which is not something your customers do gladly. Then they have to check their email, reset their password or login with the new password, many people will simply not complete the sale. A guest checkout is a simple solution that gives new and repeat customers an easy way to complete a purchase. Of course, you have to implement security measures in order to make sure that an unregistered guest still gets all the requisite details in his mail box, and you keep a record of the purchase. Although it is convenient for a user to not register but still make a purchase through guest checkout, your website might fare better if your customer did register. Each registered visitor is a potential long-term customer for an e-commerce site. A registered user receives constant updates about various offers and promotional sales on your site. He or she may also remember your brand better since they made the effort to register. This is often the reason e-commerce sites don’t allow guest checkouts. In this case, you can set up an option to register at a later stage, that is, either after making the purchase or at any stage of the checkout process. This way most new customers choosing the guest checkout option will still be registered users in the end. How do you convince ‘lazy’ Internet surfers to register? People are busy these days, you’ve got to convince that registration is worth their time. Provide an incentive. List out all the benefits arising out of being a registered user as compared to not being one. Sell it somewhat like file sharing websites sell their paid accounts. They use a unique method of also mentioning the disadvantages of not being a registered user so as to persuade the visitors more. You can also use promotional offers to persuade people to register. The few passwords that people remember are their social networking passwords. It is no news that most people on the Internet use social networking websites extensively and are always signed into them. Allowing your customers to sign into your site or register through their social networking accounts is an excellent way to not only register them in an indirect manner but also to increase their ease of use. They save themselves the effort to fill in long forms, and you still have a registered user. Check out HSN.com for such an option. The spread of mobile devices made a big change in online user behavior – people are much more willing to scroll up and down than they were before. And they prefer checkout processes that require a minimal change of pages to get anything done. Unfortunately, e-commerce websites usually have a multi-page checkout process where each step starting from login or registration to entering credit card details is carried out on a separate page. An elegant and easy way to solve this problem is to have a multi-page checkout, but present it as a “fake” singe-page checkout. Have all the steps on a single page in a vertical format under various headings. This not only tells the customer which stage he or she is on but also makes it more convenient. Stemming from the desire to provide lots of information and gather as much data as possible, lengthy checkout processes often make customers lose their steam and drop the purchase. A minimal checkout, on the other hand, allows the customer to check out instantaneously and increases the chances of a sale. For example, having twenty separate fields for ten components of information, howsoever important they may be, would put a customer off. Instead, ask only what is required and allow the customer to fill the information in broad, convenient fields. Successfully converting a visitor to a buyer is not very easy and you must keep the customer informed throughout the process. Your e-commerce site should have embedded customer-assistance features that are available in the checkout process at each and every step. The customers might have doubts regarding your product and instead of them having to leave the checkout to look for your contact number, make it easy for your customers and allow the option to chat, see FAQs, call your company etc. on that very checkout page. Even if you have to provide additional information to users, don’t let them leave the checkout process – display the required information in an overlay popup. Even opening a new window for them is not something you should do. As a part of customer assistance, many modern websites such as Abercrombie.com provide the feature of information popups at every stage. For instance, the amount for shipping or the countries where you ship can be shown as a popup when the customer reaches for the option to fill in his shipping address. A customer, especially one who shops for products in bulk will often forget which products they have put in the cart. Sometimes customers forget the specifications of the products that they have chosen. Instead of them having to go to a separate cart page, making the cart contents visible alongside the checkout process serves well in keeping the potential customer engaged and on track. Nothing puts a customer off more than the feeling of being cheated. Usually, websites which add taxes, shipping charges and other charges such as packaging and handling make the total cost visible at the end of the check-out process which creates a feeling of shock for the customer. Instead, you should make the total cost visible as soon as possible in order to appear transparent and trustworthy to the customer. Look at Footlocker.com’s check-out process for a good example of the same. Instead coming off as one of those sneaky websites, make sure that the potential customers get to review their order before clicking on the payment button. This ensures that the customers know what they are buying and if so wish to change their order, they can with ease. The lack of this may cause confusion in the minds of potential customers. Ideally, right before the final payment button, there should be a summary of all the essential details regarding the product and pricing. Checkout can be a great time to upsell something to your customers. Customers are usually excited at the point of checkout and you can use this euphoria to convince them to buy more. Add to this a smart discount and you might have the customer buying more things than initially planned. Also, you can use this time to build rapport with your customers and promote any free or really cheap products that your website is currently offering. Remember, the more polite and customer-friendly the checkout process, the higher the chances of conversion and returning customers. But be careful, the main goal of the checkout process is to finalize the sale – don’t overdo upselling, or you’ll lose customers needlessly. A great way to impress your customers is to allow for a gift wrapping option at the end of their purchase. A lot of people are buying things for others and the option to wrap the product or add a special message or anything else that you might find viable to offer to the customer can go a great way in incentivizing the purchase for them. However, be cautioned that people generally are apprehensive about gift wrapping since large websites have been known to wrap products terribly, so make sure you can deliver what you promise. This can also be a great way to earn some extra bucks. 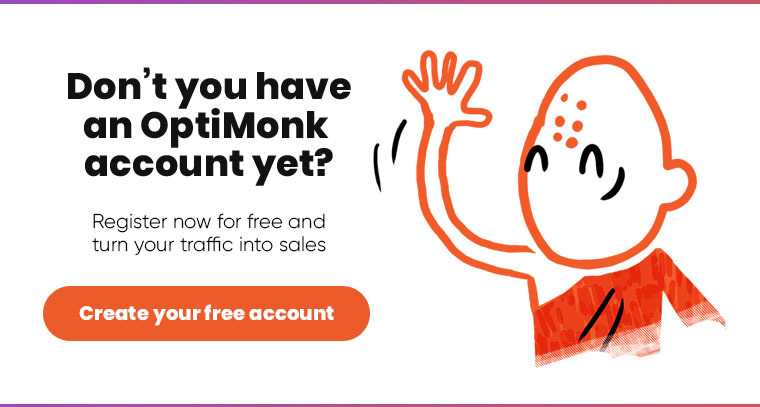 Exit-intent popups like OptiMonk can be your saving grace during the checkout process. If a visitor is leaving the checkout process without completing their purchase, you can make a popup appear which either prompts them that they are leaving or provides them an incentive to complete the purchase. Also, if your visitor has decided to leave your website, there’s nothing to lose, and you can at least get an email address of this potential customer. You can also provide an incentive to capture their email address such as a discount on their next purchase or some other offer. This is a general compilation of tips which should work for 99% of ecommerce websites. You should check all of these tips against the nature of your website, if any of these won’t work for one reason or another, don’t use it. Also, it’s important that you strategize your checkout process to make it suits your website’s nature more generally. Depending on what you are selling, a certain shopping cart design or payment process or offer may be relevant to your customers or it may put them off. The bottom line is to increase sales for your ecommerce website, make sure you spend time improving your checkout process. So which tips are you going to implement? All! 😀 Seriously, this was the most comprehensive article on optimizing checkout process that I’ve seen in ages. Even Neil Patel only offers a 6-step strategy… Thank you guys for sharing it! Just wanted to say thanks for the well written article. I am currently in the process of helping my company optimize it’s checkout cycle, and a lot of the points were very salient.